Phone carriers and handset makers got an uncommon opportunity this week to steal customers away from BlackBerry maker Research In Motion (RIMM). 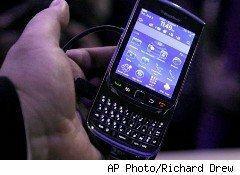 It began on Monday when RIM's network suffered an outage that spanned continents and cut off cellular oxygen for millions of frustrated customers. The three-day blackout spread like a virus as what started in Europe, the Middle East, and Africa on Monday spread to South America by Tuesday before invading the U.S. and Canada yesterday. Backup systems failed to contain what RIM called a hardware error, leading to the cascading outages that left millions without service. On Thursday, the company said full email and messaging service had been restored worldwide. But it's a little too late for many customers, many of whom went to the company's Facebook page to vent. Recognizing the severity of the situation, Research In Motion co-CEO Mike Lazaridis took to the Internet Wednesday night to issue an apology to users. "We've let many of you down," he said. "You expect better from us, and I expect better from us." Of course, if you're really unsatisfied with your BlackBerry experience, Apple (AAPL) and Google (GOOG) are ready, willing, and able to put your call right through. The Fix Is In -- or Is It? Ironically, the apology came as Apple was struggling to fulfill download demand for its new iPhone operating system. Early upgraders reported errors as millions bum-rushed the Mac maker's servers, causing a traffic spike. The issue now appears to be resolved and shares of Apple stock are rising once more. RIM, by contrast, was down more than 3% as of this writing. The message? "Restored service" isn't the same as "happy customers." We've seen this sort of behavior before, when Microsoft (MSFT) released Windows Vista to resounding jeers from early customers. Upgraders stopped upgrading. Others switched to the Mac or alternative systems. And in perhaps the biggest insult of all, Intel (INTC), Mr. Softy's longtime PC partner, said it, too, would wait for a better version of Windows. Apple profited from the backlash with a series of ads depicting John "I'm a PC" Hodgman offering silly or nonsensical ways to "fix Vista," including this gem in which Hodgman proposes a massive increase in advertising spending instead of pouring new money into repairing the operating system. We don't yet know if Apple, Android-licensees Samsung and HTC, or Microsoft partner Nokia (NOK) will attempt to similarly profit from RIM's misery. History says it's a good bet, however. At least one carrier is already preparing for a legion of Android and BlackBerry switchers. Meanwhile, popular trade-in site Gazelle.com recently said that BlackBerry trade-ins are up 49% from normal volume as users prepare to move to the iPhone. Best Buy's (BBY) FlipSwap site puts the trade-in value for the BlackBerry 9700 at $71. The retailer begins fulfilling pre-orders tomorrow. And those are just the offers we know about. Rising dissatisfaction with RIM's BlackBerry coupled with rising interest in the new features of the iPhone 4S could unleash still more trade-in deals as carriers battle to lock customers into lucrative multi-year iPhone contracts. Motley Fool contributor Tim Beyers owned shares of Apple and Google at the time of publication. The Motley Fool owns shares of Apple, Microsoft, Intel, Google, and Best Buy. Motley Fool newsletter services have recommended buying shares of Intel, Microsoft, AT&T, Apple, and Google, as well as creating bull call spread positions in Microsoft and Apple and a diagonal call position in Intel.